Even if we weren’t doing the shows, I’d still be working on music for fun,’ says Chris Stein, guitarist and co-founder of Blondie. ‘It’s not like I’m going to suddenly start… gardening or something. 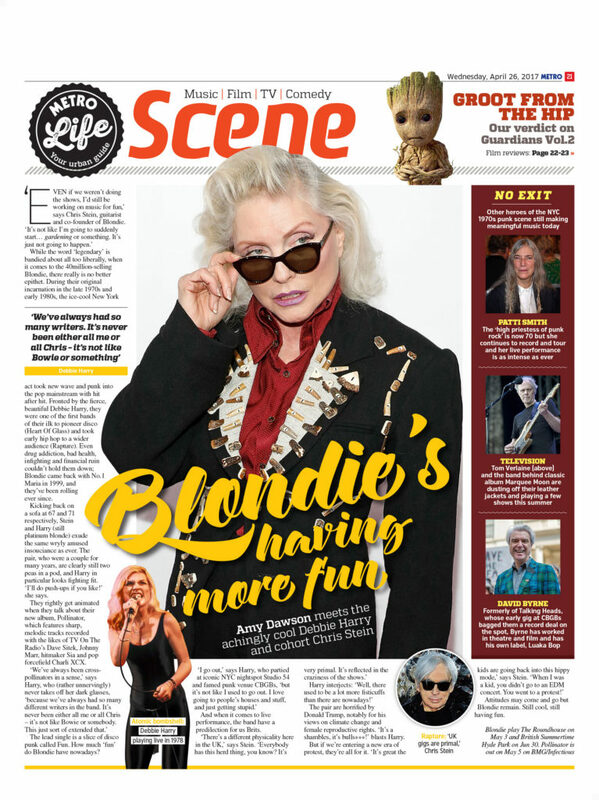 It’s just not going to happen.’ While the word ‘legendary’ is bandied about all too liberally, when it comes to the 40million-selling Blondie, there really is no better epithet. During their original incarnation in the late 1970s and early 1980s, the ice-cool New York act took new wave and punk into the pop mainstream with hit after hit. Fronted by the fierce, beautiful Debbie Harry, they were one of the first bands of their ilk to pioneer disco (Heart Of Glass) and took early hip hop to a wider audience (Rapture). Even drug addiction, bad health, infighting and financial ruin couldn’t hold them down; Blondie came back with No.1 Maria in 1999, and they’ve been rolling ever since. Kicking back on a sofa at 67 and 71 respectively, Stein and Harry (still platinum blonde) exude the same wryly amused insouciance as ever. The pair, who were a couple for many years, are clearly still two peas in a pod, and Harry in particular looks fighting fit. ‘I’ll do push-ups if you like!’ she says. They rightly get animated when they talk about their new album, Pollinator, which features sharp, melodic tracks recorded with the likes of TV On The Radio’s Dave Sitek, Johnny Marr, hitmaker Sia and pop forcefield Charli XCX. ‘We’ve always been crosspollinators in a sense,’ says Harry, who (rather unnervingly) never takes off her dark glasses, ‘because we’ve always had so many different writers in the band. It’s never been either all me or all Chris – it’s not like Bowie or somebody. This just sort of extended that.’ The lead single is a slice of disco punk called Fun. How much ‘fun’ do Blondie have nowadays? ‘I go out,’ says Harry, who partied at iconic NYC nightspot Studio 54 and famed punk venue CBGBs, ‘but it’s not like I used to go out. I love going to people’s houses and stuff, and just getting stupid.’ And when it comes to live performance, the band have a predilection for us Brits. ‘There’s a different physicality here in the UK,’ says Stein. ‘Everybody has this herd thing, you know? It’s very primal. It’s reflected in the craziness of the shows.’ Harry interjects: ‘Well, there used to be a lot more fisticuffs than there are nowadays!’ The pair are horrified by Donald Trump, notably for his views on climate change and female reproductive rights. ‘It’s a shambles, it’s bulls***!’ blasts Harry. But if we’re entering a new era of protest, they’re all for it. ‘It’s great the kids are going back into this hippy mode,’ says Stein. ‘When I was a kid, you didn’t go to an EDM concert. You went to a protest!’ Attitudes may come and go but Blondie remain. Still cool, still having fun.